Finally! 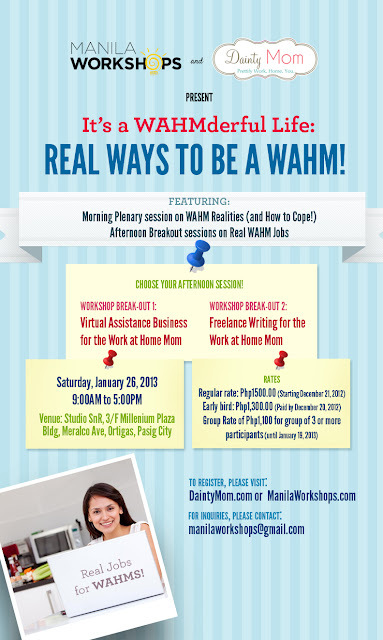 After the success of their 1st sold out event, DaintyMom and ManilaWorkshops.com are back to present the 2nd workshop of their It's a WAHMderful Life series entitled, It's a WAHMderful Life Workshop: Real Ways to be a WAHM . This time, the workshop will have breakout sessions to choose from so that you can focus on the WAHM job that interests you. A WAHMderful Life: Real Ways to Be a WAHM is a one-day workshop for moms who want to find their bliss working from home while making a home. This is for stay at home moms, moms who want to start a home-based business, moms interested in working from home via outsourcing or telecommuting, women who are interested in starting a online business ... or anyone (single ladies, even dads!) who want to know more about starting a work-from-home career.